2/25: Lenny Sasso places 2nd at the District 21 Tournament and will wrestle in Tuesday Night's opening round of Region action. 103: Anthony Olcott, S, won by forfeit. 112: Tracey Gennusa, N, d. Andrew Roberto, 4-0. 119: M. Smyth, N, p. Zach Barden, :48. 125: R. Diletto, N, won by forfeit. 130: Dan Aquafroda, S, d. Chris Leva, 6-1. 135: John McDermott, N, d. Mike Kevlin, 12-2. 140: Vince Speizio, N, p. Frank Falco, 4:19. 145: Lenny Sassi, S, p. N. Condit, 4:43. 152: Chris Cavanaugh, N, d. Kyle Patton, 9-4. 160: Chase Badger, N, d. Ken Thoman, 16-15. 171: Sheamus O'Connor, N, p. Pat Sewell 1:02. 189: Tom Swennon, S, p. Joey Choi, 2:27 215: Jack O'Connor, N, p. Dan Calabrese, 2:51. 275: Ron Grant, N, d. Justin Lazarchick, 4-2. 215: Nale (M) p. Calabrese 4:51; HWT: Lupo (M) p. Lazarchick 1:10. Kevlin (135), Sasso (145), Patton (152), Thoman (160), and Nelson (171) had pins for the Lancers, who also received 7 forfeits. 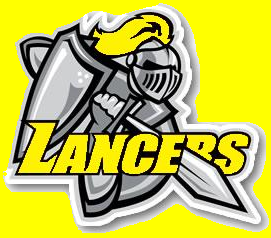 News 12/17 - Lancers go 2-1 at S. Brunswick Quad.